Researchers at Exeter used their GraphExeter material (compressed ferric chloride molecules between two sheets of graphene) to bring flexible electronics a step closer. 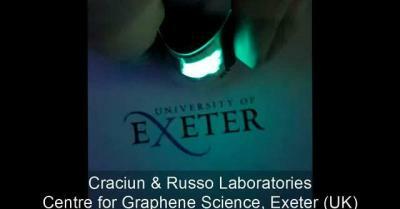 GraphExeter allows for a new system that is a better conductor of electricity than graphene, and can be used to make large, flat and flexible lighting. The main advantage is that the material is capable of high luminosity, reportedly beating comparable products by 50% greater brightness. One limitation with the current developments in flexible screens is that the brightness that can be achieved decreases as the screen becomes larger, but GraphExeter is said to overcome this. In addition, the lights are not only brighter, they are very resilient and can be folded multiple times without loss of functionality. Potential applications include televisions, smartphones, flexible lighting fixtures and many types of wearable electronic devices. Will graphene adaptation 'GraphExeter' replace ITO?